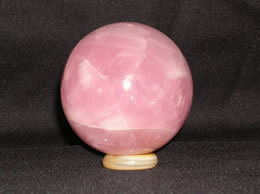 Rose Quartz Ball and Sphere are used for Meditation and healing purposes. Rose quartz Stone radiates loving energy to the surrounding. Hence they are used for attracting love, peace and prosperity. They are also used as activators for healing. These beautiful Rose Quartz balls are handcrafted from the best Rose quartz mined from mother earth.